Watering efficiently new lawns involves a special set of rules for newly seeded lawn or newly sodded lawn’s. Sprinkling is, at the least, and every day requirement. For seeds to germinate or sod roots to nit, watering is often required more than once a day. This is especially true if you are in a dry climate, or are experiencing drought conditions. Watering efficiently new lawns in these conditions will avoid the new sod from turning brown and dying. But what to you do when it comes to existing lawns? How often and for how long should you water? Besides watering more deeply and less frequently, you can increase watering efficiency by improving other cultural practices. Two major problems that result in poor water penetration are thatch and compacted soil. If the problems are bad enough, either can actually repel water, causing wasteful run off. Regular D thatching and aerating can increase water penetration, Provide air in the root zone, and aid in nutrient simulation. 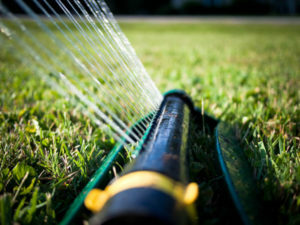 You can conserve water by following recommended mowing heights and by adding fertilizers that are high in potassium and low in nitrogen before hot weather arrives. Fertilizing properly is an important factor in efficient watering. Under fertilizing invites competition from water hungry weeds and reduces the capacity of the lawn for wear and tear. Over fertilizing can be just as damaging. It promotes vigorous, water and regrowth of the lawn, which causes thatch to develop and reduces the ability of a cool season grass to recover from summer dormancy.